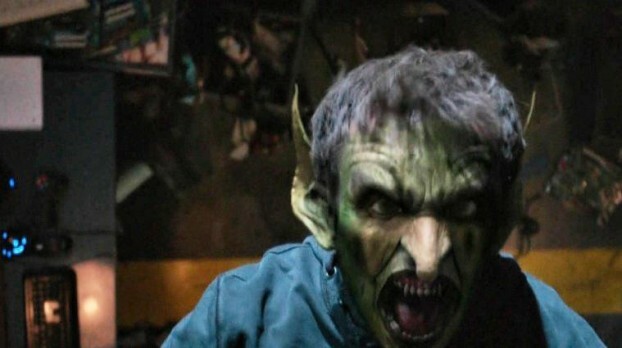 Our Wesen of the Week: The Fuchsteufelwild. Someone is killing off the team of four programmers that wrote the breakthrough code for an online RPG. The twist? He is in the game, and he kills them in the game first. Would you like another twist? 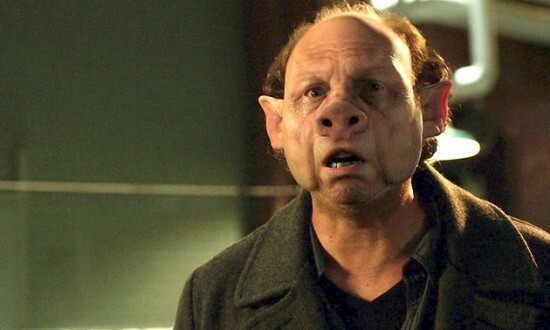 He’s also a Wesen. A Fuchsteufelwild to be exact. A troll/goblin like creature with two giant acidic fingernails that it uses to cut its’ victims in half. Based on the amazing luck that Sgt Wu is a gamer and puzzle fan, the police are able to determine that their suspect is an IT contractor that the head of the project (Jenna) called for help late one night. She promised him a dinner date, but stood him up. 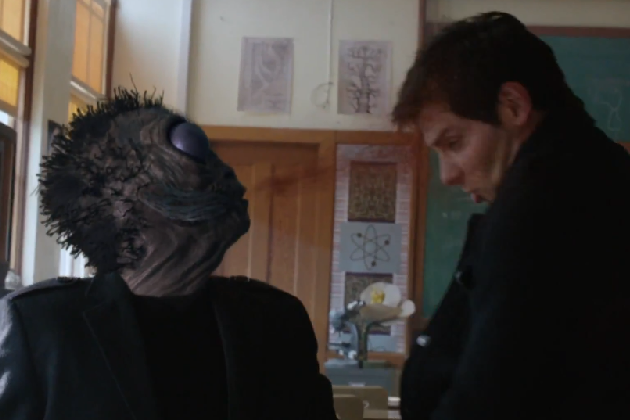 A new Wesen is introduced in this episode, a man who picks up woman at grief support groups. He gets invited back to their home, and spews a Great Muta (or Tajiri for younger readers) like red mist into their face. This blinds the women, and he then turns into a fly and drinks their tears. The first woman dies after pulling a giant bookcase down on herself. The second victim survives, as her sister came home while the attack was taking place. The Medical Examiner finds that the victim’s eyes are infected with a type of worm that is normally found in River Blindness in Africa. Nick, Hank, and Monroe are able to determine that the suspect is a Jinnamuru Xuntee (before I looked it up, I had spelled it Ginimurushuntae), a tear stealing evil spirit. When beheaded, its brain is found to be swollen and infested with red worms. It will also revisit victim’s families, to feed off of their tears. Based on his M.O. of grief support groups, they are able to track Andre’s (the Jinnamuru Xuntee) car to a high school. He is leaving the meeting with a woman when Hank, Nick, and Sgt. Wu chase him back inside. They split up, and Nick finds Andre in a classroom upstairs. Andre spits the red mist into Nick’s face and jumps out the window. Nick is unconscious from the purifying potion. Monroe explains to Juliet that this is a normal, necessary part of the process. Captain Renard confirms that this happened to him when he took drank the mixture. Juliet wants to call an ambulance, but the others try to talk her out of it. Juliet doesn’t understand what is going on, but Monroe explains the situation to her the best he can. Rosalee makes a potion for Captain Renard and Juliet to drink, and the secret ingredient is some of Nick’s blood. They do not tell Juliet and the Captain that Nick’s blood is in the potion. Juliet and the Captain drink the potion, but they won’t know for a while if it worked. Juliet leaves, emphasizing that she is going home alone. Nick follows her home to be sure that no one, especially Captain Renard, comes to her house.